Your Cup of Joe and a Free MacBook Pro! I love coffee, as a matter of fact, I drink a couple cups almost every day! I did a little math and figured out that a coffee lover can have their favorite coffee and get a free Mac Pro Laptop or two iPads at the same time, as well as a new espresso machine – all while saving about 150 hours a year (that’s almost a month at work!). Not bad eh? Which is better, Lavazza or Tony’s? 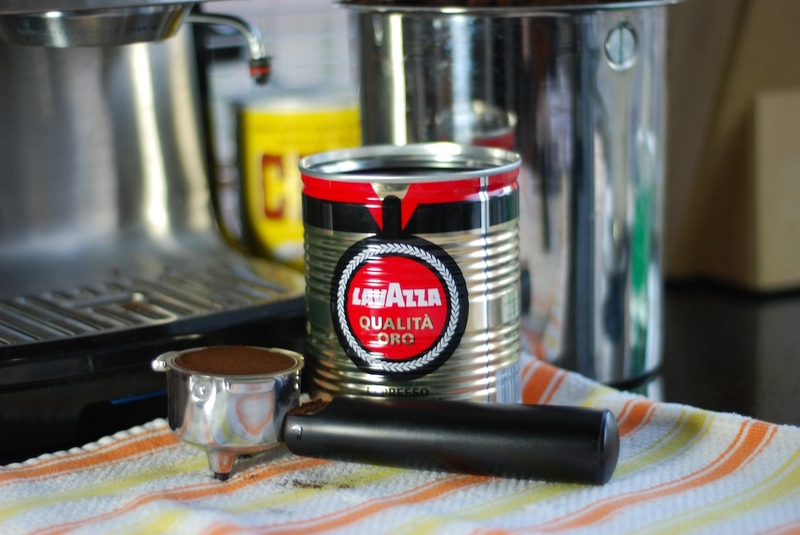 I love them both, but give Tony’s Espresso Roast the edge, and it costs less – try them both, and keep your Lavazza can for storage! I drink Americano’s – a shot of espresso with boiling water. The flavor is richer than regular brewed coffee and I can make them one at a time faster than I can brew a pot – and I never waste a drop. A single shot of Tony’s Espresso costs about .16 cents – so if I have two shots a day, that’s .32 cents – or about $117.00 a year – not bad at all! 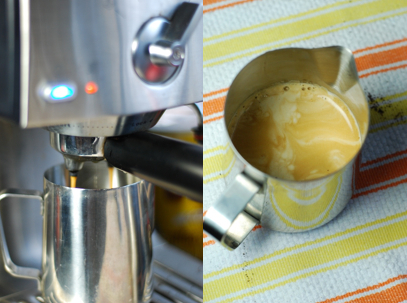 My espresso machine has worked flawlessly for 5 plus years, it cost me less than $90 ($125 when I looked it up today). Throw in the cost of a new machine and $25 a year for electricity (which doesn’t count in my solar powered kitchen), that means the maximum cost would be about $267.00 a year on coffee – truly great coffee at that! A great cup of espresso takes about 18 seconds to make as it’s forced through the fine ground coffee under pressure – which produces a rich ‘crema’ top that is my favorite part! If I bought two single shot Cafe Americano’s at my local Starbucks each day, I’d pay $1.89 per cup – or $1380.00 a year. Eek! To make matters worse, the stops would that take me an extra 20-30 minutes per day (about 150 hours a year). Not accounting for the driving time or gas – and including the cost of a new espresso machine and electricity, that’s a difference of $1113.00 – or enough for a brand new MacBook Pro – or two iPads Nothing against Starbucks, they brew a great cup and the workers are always a pleasure – but that’s a lot of green! Now if you drink cappuccino, latte, frappucino or a quadruple skinny soy caramel mocha-chino, your costs AND savings would be even greater – but I kept it simple and conservative for this comparison. The perfect Cafe Americano in my good old commuter cup (circa 2005 – keeping many thousands of cups out of the landfills). 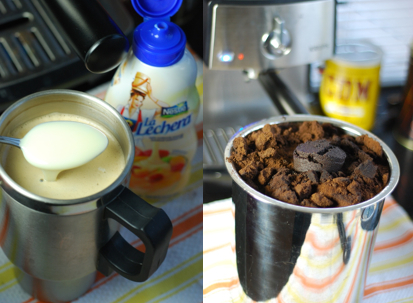 Sometimes I add sweetened condensed milk (Eagle Brand Milk, or La Lechera in a handy squeeze bottle) – a little trick I picked up in Asia. Right: Harvest the coffee grinds for your compost pile or garden, it’s a great soil amendment! As for coffee, I suggest DAZBOG espresso or one of their dark blends ground like espresso – or just brew it nice and dark in your coffee maker. Lavazza is another excellent choice for espresso. So I guess this means I can justify running out to buy a new computer or IPads for the fam? Um, no.